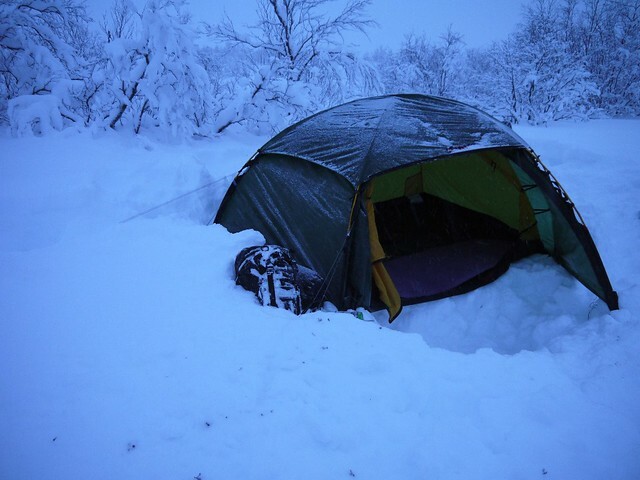 The tent I’ve chosen for my upcoming trip to Lapland is the Hilleberg Allak . I know Hilleberg are not the cheapest tents around but I’m a fan of their ability to over engineer tents making them more suitable for more extreme stuff. I chose a spacious 2 man tent because of all the time that will be spent in the tent while up North (only 3-5 daylight hours during the trip). 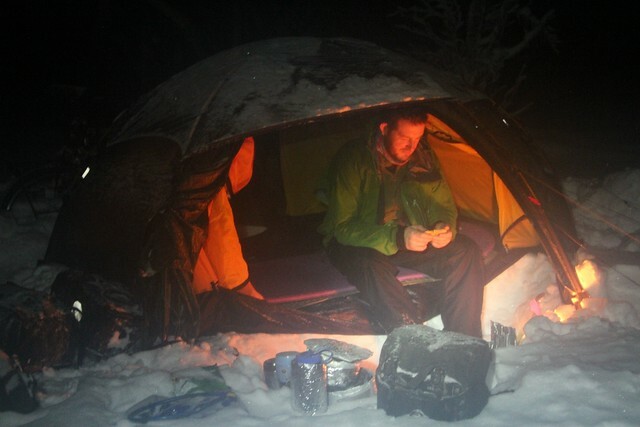 You also need more space when winter camping for all that gear, the last thing you want is to brush your down jacket against a damp inner tent while changing cloths. The Hilleberg Allak weight is 3.3kg( including bags, guylines, poles, pegs and spare pole) it is a little heavy for a solo cyclists but that’s life. I briefly considered the Staika from Hilleberg too because it has stronger 10mm poles and stronger Kerlon 1800 material and allegedly better zips etc but at 4kg it’s just too much (though around the same price as the Allak). The tent seems as well built as other Hilleberg tents, two entrances (both with the option of a mesh door), lots of ventilation options. The only significant problem with the tent is the price and relative high weight. It is possible to shave a little off the weight by removing the overkill of advertising badges and maybe using lighter guylines, but that wouldn’t be any more than 50-100g I suspect. This small saving is of course irrelevant considering all the extra gear that is needed for a winter trip, including 500g of Snow Stakes. Rather than spending €50 on a footprint I’m using my oldMSR hubba hubba footprint which fits perfectly under the main tent. 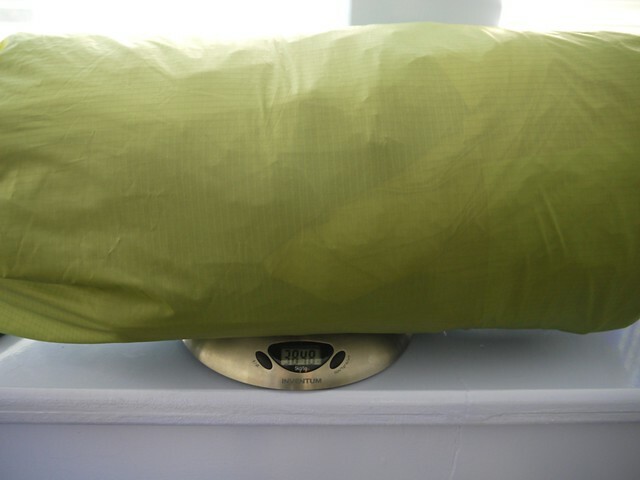 This photo shows the weight of the tent at 3848g. This is including the Msr Hubba Hubba footprint, MSR tent bag (its a better size than the original one), 8 dac tent pegs, 9 snow pegs and my own lightweight guy lines instead of the standard Hilleberg ones. Far from lightweight but not bad considering there’s a footprint and half a kilo of tent pegs in there. This tent is certainly in theory ideal for extreme weather. 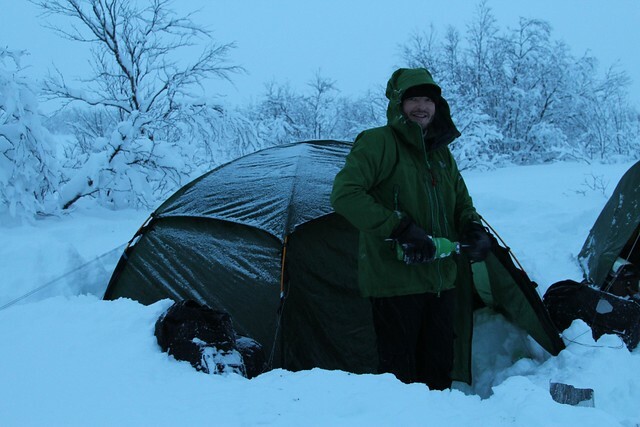 After the three weeks winter camping in Lapland I’ll do a full review. 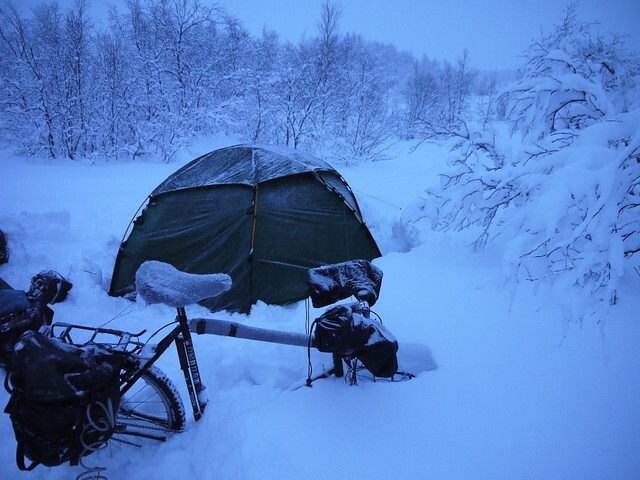 In total I only used the tent for about 8 nights between -10 and -30 degrees C during my Lapland trip, on the milder nights we just made a snow trench and slept in our bivvy’s. In general I found the Allak to be quite a pain to set up in the cold. The combination of 3 poles, 6 guy lines, a couple of dozen hooks to attach the poles to the tent and that loose roof thingy proved very time consuming in snow with gloved hands. 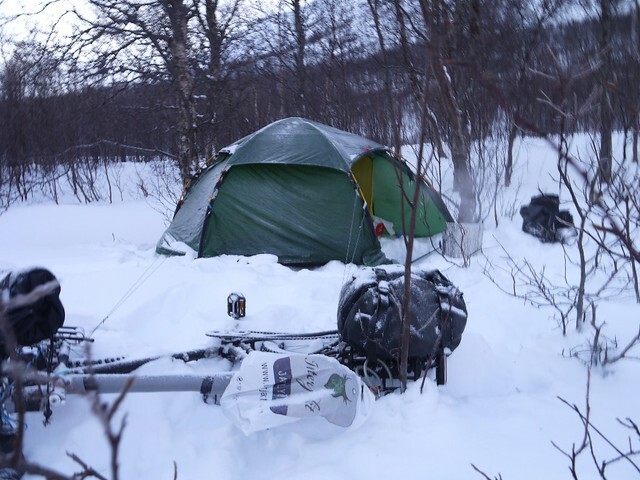 The tent is of course very well built, has good snow shedding properties (I often heard a woosh in the night as another layer of snow fell off) and is very stable thanks to the several guy lines, anchor points and 3 Dac poles. I left the original tent bag at home thinking it was too big, this proved to be a mistake as I tried stuffing the tent into a smaller bag with frozen hands and thick gloves on. All of the camping nights with the tent were at -15 degrees C or below. The tent has a couple of vents and the option to use mesh doors (by unzipping an area of the door like many other Hillerberg tents). But these features all proved to be fairly irrelevant in the extreme cold as all condensation just froze. That said, the temperature in the tent was a good 5 degrees warmer than outside with all the doors closed. By digging a small snow trench in the porch area it was very comfy and spacious for “chilling out” in the evening, but the tent isn’t really any bigger than my MSR Hubba Hubba. Apart from the obvious “fortress” properties of the Allak I’m not convinced this was the right tent for the job. Many of the features (vents and way too many zips) that make it great for the European climate(damp), just make it extra heavy and bulky for serious winter use, I’d rather have something more simple. I’d quite like to have a tent of about the same size that is a kilo less in weight and needs alot less time to set up. Though I’m a strong advocate of free standing double skinned tents, I would seriously consider a single skinned tent or strong tunnel tent for a longer winter trip just to save weight and space as I have a bivvy bag anyway. you might be pleased to know that your (and now my) Allak is still in full use. We just returned from an 18 week bike trip in China, Laos and Vietnam. We only used it in the first half of the trip – in the Tibetan mountains – but we certainly couldn’t have done without it.